How is Centennial Beach different from a pool? 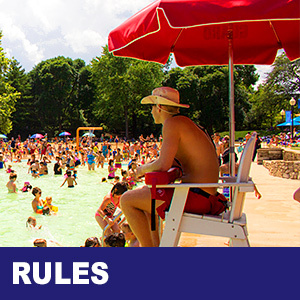 Does Centennial Beach have any special rules or requirements? The Deep Water Test is the most unique requirement we have. 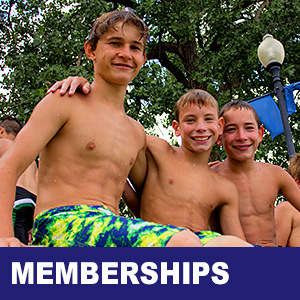 Patrons who have not yet graduated from the 8th grade are required to take a swim test prior to entering the deep end/diving board area. This is for the safety of all swimmers. 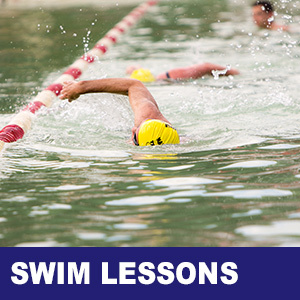 The test consists of a swim of 100 total meters using the freestyle stroke and using side-to-side breathing. A complete Deep Water Test description and comprehensive facility rules information can be found at CentennialBeach.org/Rules. Why is the water less clear than a swimming pool? Centennial Beach’s water is chlorinated, re-circulated and hand-skimmed to remove debris, but it is not filtered like a typical swimming pool. Is the water quality tested? Yes – our staff tests the water 2-3 times daily to monitor chlorine levels and pH balance. We typically follow swimming pool regulations with regard to water quality standards. On a weekly basis, our water is sampled and tested by an independent laboratory to ensure that the water quality is being maintained. Can I bring in my own food and beverages to Centennial Beach? Yes – patrons are allowed to bring in coolers of food and beverages. However, alcohol of any kind and glass containers of all types is prohibited on the premises due to safety concerns. All patrons’ coolers and bags are subject to search upon entry. 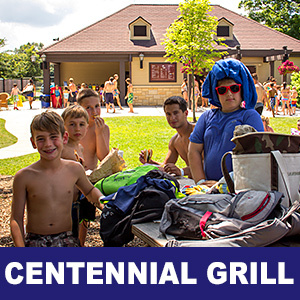 Food also may be purchased at our Centennial Grill. Centennial Beach has free parking in its lot. However, on busy days, the parking lot may fill up quickly. There is plenty of on-street parking within walking distance of the facility. Does the facility ever reach capacity and have to close to additional guests? Yes – the Beach has reached capacity in the past, but that’s happened only on those extraordinarily hot days or holidays. It is not a frequent occurrence. In the event that the facility reaches capacity, we close the park to additional guests until other patrons leave. Why do you take safety breaks each hour? Our safety breaks are a great opportunity for swimmers to take a break from the water, rest and check-in with family members. Do you give rain checks? Centennial Beach does not issue rain checks. We recommend that our guests check the weather prior to paying their admission and entering the facility. Do you have a locker room and guest lockers? We have gender-specific, open-air locker rooms with showers, individual changing stalls and restroom facilities. Family changing rooms are also available. We have both coin-operated lockers and those that can be used with personal padlocks. Locks must be removed daily. At what age can kids swim in the deep end? Kids can swim in the deep water regardless of age, provided they have passed the Deep Water Test. Can my kids use floats, inner tubes, noodles or other water toys? We do not allow the use of floats, tubes or noodles at the Beach. You may bring in small water toys and soft/squishy balls. Only Coast Guard approved floatation devices are permitted. There are a limited number of life jackets available at the Beach. For the safety of all of our swimmers, and per the Illinois Department of Health, children who are not toilet-trained must wear swim diapers while in the water. Can I bring my pet to Centennial Beach? Per the Illinois Department of Health, pets of any kind are not allowed in the facility. The exception to this restriction is service animals. Follow I-88 East towards Chicago, exiting at Winfield Road. Turn right onto Winfield Road, and follow it to Diehl Road. Turn left onto Diehl Road and continue to Mill Street and turn right. Follow Mill Street to Jackson Avenue and turn right. Follow I-294 South towards Indiana. Merge onto I-88 West towards Aurora and continue to the Naperville Road exit. Turn right onto Naperville Road, which will become Naper Boulevard at the fork (stay left). Proceed South to Chicago Avenue and turn right. Follow Chicago Avenue into downtown Naperville to Main Street, turn right and then turn a quick left at Jackson Ave. Follow I-355 South towards Joliet to the Maple Avenue exit. Turn right on to Maple Avenue, which will become Chicago Avenue. Follow Chicago Avenue into downtown Naperville to Main Street, turn right and then turn a quick left at Jackson Ave. Follow I-80 East to I-55 North towards Chicago. Continue with directions below via I-55. Follow I-55 North towards Joliet/Chicago to the Weber Road exit. Turn left onto Weber Road, which will become Naper Boulevard. 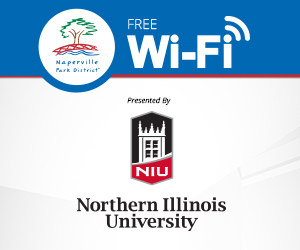 Follow Naper Boulevard to the fork. Follow the fork left onto Washington Street. Take Washington Street into downtown Naperville. Turn left at Aurora Avenue to the stop light at Eagle Street and turn right. Continue to the stop sign at Jackson Avenue and turn left. Follow I-294 North toward Wisconsin. Merge onto I-55 South toward St. Louis and follow to I-355 North. Continue with directions below via I-355. Follow I-355 North to the Maple Avenue exit. Turn left onto Maple Avenue, which will become Chicago Avenue. Follow Chicago Avenue into downtown Naperville to Main Street, turn right and then turn a quick left at Jackson Ave. Follow I-55 South towards St. Louis to I-355 North. Follow I-355 North to the Maple Avenue exit. Turn left onto Maple Avenue, which will become Chicago Avenue. Follow Chicago Avenue into downtown Naperville to Main Street, turn right and then turn a quick left at Jackson Ave. Follow I-290 W to I-88 West towards Aurora. Continue with directions below via I-88. Follow I-88 West towards Aurora to the Naperville Road exit. Turn right onto Naperville Road, which will become Naper Boulevard at the fork (stay left). Proceed South to Chicago Avenue and turn right. Follow Chicago Avenue into downtown Naperville to Main Street, turn right and then turn a quick left at Jackson Ave.